Montrealers are truly fortunate to be within a short trip of so many gorgeous provincial parks both within our own province and just across the “border” on the Ontario side. One thing to note, as we’ve mentioned before, is that Quebec provincial parks are actually called “national parks” since Quebec is officially recognized as a distinct nation. These parks are overseen by an organization called Sepaq, whereas provincial parks on the Ontario side are managed by Ontario Parks. Here are the top provincial parks around montreal. Oka Park is truly an oasis for Montrealers. Located just a bit north of the city, this park is a haven of trails, wildlife, activities, camping and beautiful beaches. The park also houses Calvaire d’Oka, a historical landmark comprised of 4 oraties and 3 chapels that date back to 1740. With its rich history, plethora of activities, sandy beaches, gorgeous wilderness and diverse wildlife, this park may be small, but it manages to have something for everyone, including Hippocampe recreational wheelchairs enabling people with disabilities to experience the park all season long. Oka park has traditional camping facilities, but if you want to camp without getting too rugged, they also have well equipped “glamping” campsites that are fully set up for you including sleeping cots, propane stoves, a mini fridge, dishes, cooking utensils and even electricity. Don’t let the French names fool you. Chute-à-Blondeau, where Voyageur Park is located, is actually in Ontario and is about an hour drive from Montreal. This gorgeous park boasts four separate beaches along the Ottawa river and a host of activities for the whole family. Swimming, boating and fishing are very popular at Voyageur, given the amount of beachfront, and you can rent equipment on site. There are also hiking and biking trails, as well as skiing and snowshoeing in the winter. Camping facilities are well equipped for traditional camping (no “glamping” here) or RV camping, and if you prefer a more serene experience you can choose from either the pet-free or the radio-free campgrounds (but don’t worry, the main campground allows both pets and radios). Does it get anymore pleasant than Plaisance? Although this park is open and accommodating to the whole family, many people visit on their own to take in the serenity and peacefulness in solitude. It’s said to be a perfect destination for walking meditation. The park is characterized by its wetlands, which feed the soft forest floor and welcome a variety of bird and plantlife. In addition to hiking and walking trails, Plaisance also offers biking trails, swimming, boating and fishing. You can also really camp in style at Plaisance. They have traditional camping, fully equipped “glamping”, yurts and even a quaint farmhouse for rent. As the name suggests, Parc de la Gorge’s main attraction is the huge gorge! Or rather, the suspended footbridge used to cross it, which is the longest of its kind in all of North America. Though not actually a provincial or national park, it is its own nonprofit foundation and dedicated to preserving the natural beauty of the territory. The footbridge is not to be missed, and if you’re brave enough to cross it, won’t be soon forgotten. They offer a variety of summer and winter activities including Foresta Lumina, a multimedia nighttime experience of the park that draws you into the little known world of Quebec mythology. Like Jacques-Cartier, Parc de la Gorge is also open for winter camping as well as summer camping and year round “glamping” and cabin accommodations. The scenery alone at Jacques-Cartier park is worth the roughly 4 hour drive from Montreal. 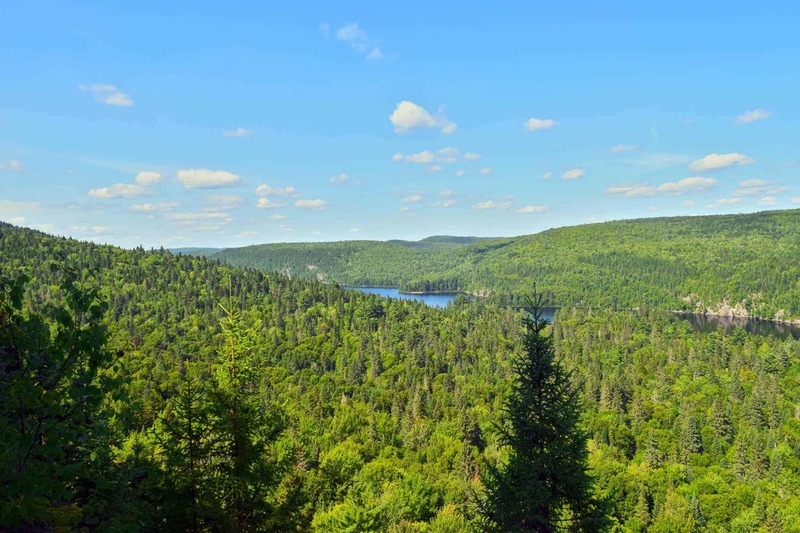 With deep valleys, mountainous terrain and the Jacques Cartier river flowing through, the many hiking and walking trails help you reconnect with nature and forget the bustling, noisy city you left behind. The camping experiences at Jacques-Cartier are truly unique, as it is one of the few parks that allows winter camping. They also provide traditional campgrounds, “glamping”, yurts, cabins, rustic shelters and the stunning EXPerience cabins with floor-to-ceiling windows to create a “one with nature” (but separated by glass) sleeping experience. Though it can be hard for Montrealers to remember as we sardine ourselves onto the metro during rush hour, we are fortunate to be surrounded by so much nature. Even just a short trip into the wilderness can be enough to help you recharge your batteries and gain a new perspective on the world. So grab yourself a Communauto and start planning a trip to the woods!